Sweet and savory notes highlight Kabobs’ classic Bacon Wrapped Date with Almond. 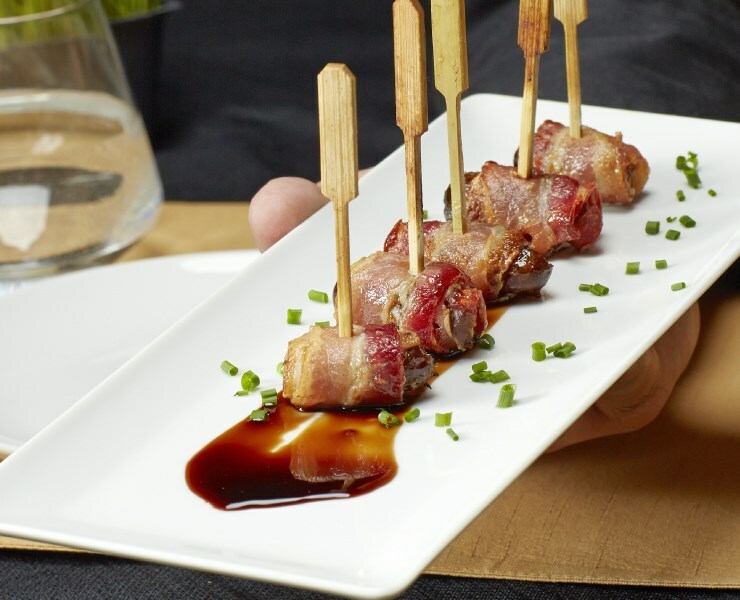 Consisting of lean, hand-sliced, applewood smoked bacon, paired with the sweet exotic flavors of dates, these classic hors d’oeuvres, provide the right amount of simplicity and sophistication to your dining event. Perfect plain, or served with a balsamic reduction or sweet red pepper sauce. Great plain, or with a balsamic reduction or sweet red pepper sauce. Also a great accompaniment to a crisp salad. A large (31/35ct) tail-off shrimp wrapped in lean bacon held together with a toothpick skewer. A garden fresh mix of edamame, napa cabbage, scallions, carrots and shoepeg corn, accented with an Asian-inspired blend of herbs and spices, placed in a thin dumpling wrapper. Harmonious sweet and savory pairings of Calimyrna Figs and Mascarpone wrapped in a light buttery phyllo beggar's purse. Slow roasted pulled pork, paired with a smoky hardwood bacon barbeque sauce, placed on a mouthwatering buttermilk biscuit disc. Two pieces of juicy chicken marinated in a traditional medley of Mediterranean flavors including fig, olives, white wine, and lemon. Then skewered with a quartered golden Calimyrna fig and a roasted tomato.